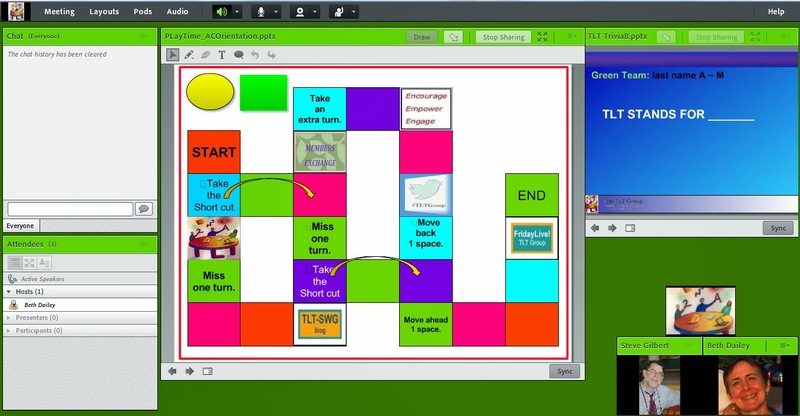 This experiment involved taking a game board activity and adapting it to Adobe Connect. Every webinar has unique functionality. In Adobe Connect only presenters can use whiteboard tools, so volunteers are needed and their status changed to presenter for the duration of the game. I hope this recipe will help you give it a try. It was a fun and engaging experiment. I very much appreciate those who volunteered to help. I had a much smaller group than anticipated and plan to try it again with a larger group to see how it goes. Game Board. There are a variety of free templates for developing question cards and game boards. 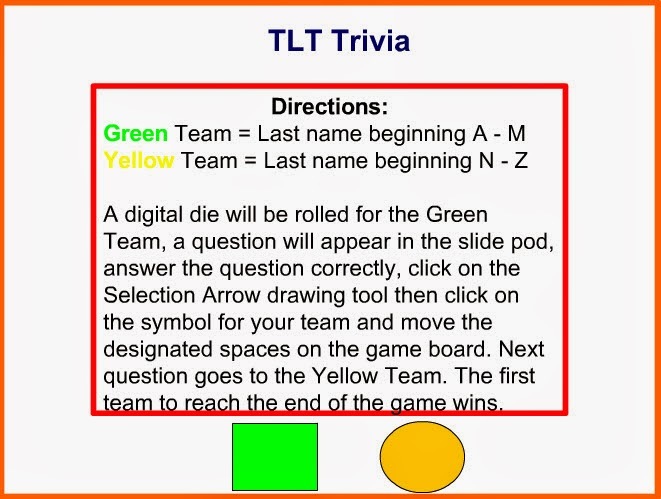 This link will take you to a very simple PowerPoint game board. You can customize the game board by adding images to the board relevant to the topic. Below is an image of the Adobe Connect layout. A Set of Multiple Choice Questions. The site above also has a template for making question cards which could be use in a face to face setting. I used PowerPoint to create a slide for each question with the answer animated to appear with a click. Tokens. There a few symbol choices available using the whiteboard tools in AC. I created two symbols and filled them in with a different color. Die. I used a digital die from this site, http://www.random.org/dice. I rolled the die off camera and told them the result. It would have great to roll the die within Adobe. In preparation for the game, the questions need to be developed and the PowerPoint or card set created. In addition the game bard can be customized. Obtain two volunteers willing to move the token for each team. Change their status to presenter. Participants are not able to use whiteboard drawing tools. I then gave the volunteers directions on how to move the token using the select drawing tool. throughout the game board. Give the volunteers a chance to practice. I revealed the question and then allowed anyone on the team to answer. If they all have mic access this could take place orally if not, then the answers could be shared in the chat pod. If the team did not have the correct answer, I allowed the other team an opportunity to answer. Below is the Adobe Connect room layout during the game.